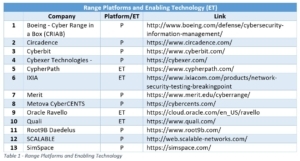 Cyber Ranges as Workforce Enablers. job shortage. This lead to some well-trained professionals, and even more under-trained, or ill-trained pilots and doctors. Lives were lost due to the ad-hoc nature of training and certification. Eventually, both aviation and medicine developed a new model for training, new standards for operational experience, and in the case of flight training, significant simulation systems to give pilots opportunities to practice safely. In cybersecurity, we are in a similar period where conventional training models are insufficient to fill the cyber skills gap. As with flight training – and medicine to some extent – the enabling technology is simulation/emulation. The essence of this report is correct simulation/emulation gives us the power of Predictive Operational Performance (POP) for cybersecurity professionals. It instills confidence in cyber workforce seekers and cyber workforce employers that training will predict job success. 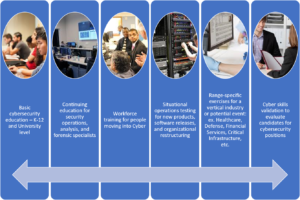 This report’s purpose is illuminating the critical role of cyber ranges as the catalyst to closing the cyber workforce skills gap.